Villa Lauda Bed and Breakfast - Hotel in Rimini (Italy). 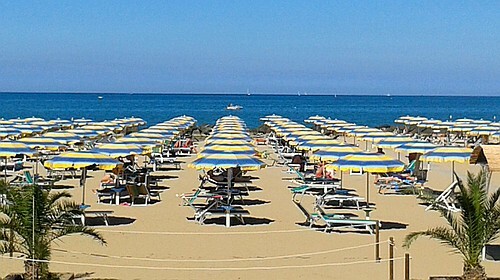 Budget stay on the Adriatic Coast of Italy, close to the Beach, with Restaurant and in good position. An independent house with private garden, Villa Lauda is just 50 metres from the public beach in Rimini. A generous breakfast buffet is available until 11:00. During pleasant weather breakfast is served in Villa Lauda's ground-floor veranda. The rooms are functional and feature a balcony, a private bathroom with shower, and cool tiled floors. Each room features a 22'' LCD TV and Air Condition. Return at Night without time limits. This easy-going B&B offers free Wi-Fi. Dining possibilities by us or at various restaurants conventionated. Discover the most fun activities to do in Rimini, even in case of bad weather. Bike rental available on site. At 50 meters from us there is the beach. Also available a stretch of free public beach. Near swimming pool with water slides. Near Fiera di Rimini and Palacongressi. Free parking, internal and external. Breakfast buffet with homemade cakes. Return of the night without a time. 100 meters from bus stop. Buy tickets for all Amusement Parks directly from us. At 50 meters the beach and swimming pool with water slides. Free at the park of miniatures and fun. Admire the spectacle of nature with your own eyes. Discounted sale of tickets for the park. Possibility to buy tickets for the main parks of the Adriatic Coast. Rimini is not only beach and entertainment, discover art and history of the territory. Pricelist and all our available services. Opening season 18 April 2019. Offers available for Events, Beach, Parks and long Stay. Calculates a free quotation or book now. Many events, only 4 km from us. Private Clinic at only 1,6 Km from us. Hoping that these pages were still help greet you with sympathy. Rimini ist nicht nur Strand und Unterhaltung, entdecken Sie Kunst und Geschichte der Region.